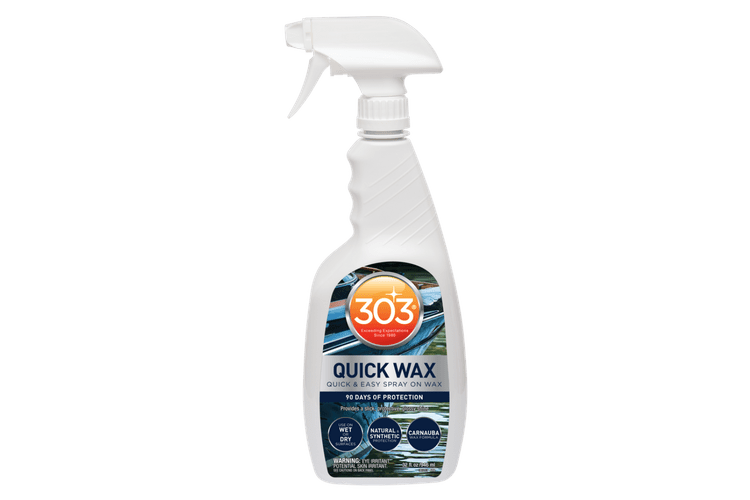 303® Citrus Cleaner & Degreaser safely brightens and rejuvenates surfaces by removing dirt, grease, oil, and much more. It also contains UVA/UVB blockers for maximum protection against harmful sun rays. 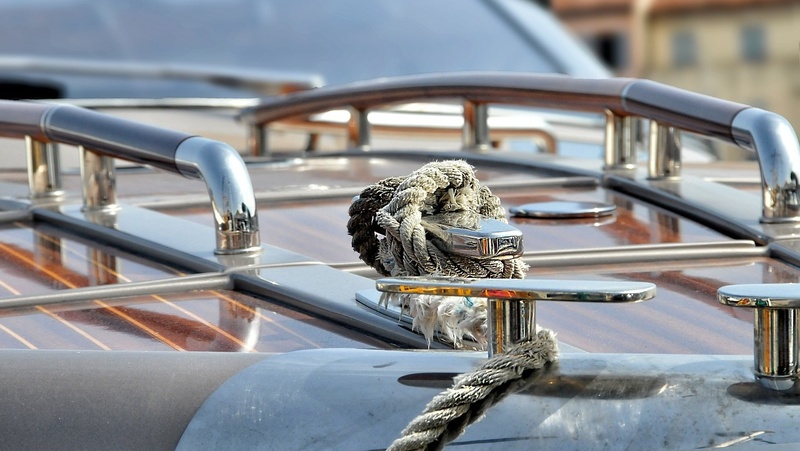 It is alcohol, ammonia and solvent free, and safe for use on all water-safe materials, including: fiberglass, plastic, chrome and painted surfaces. 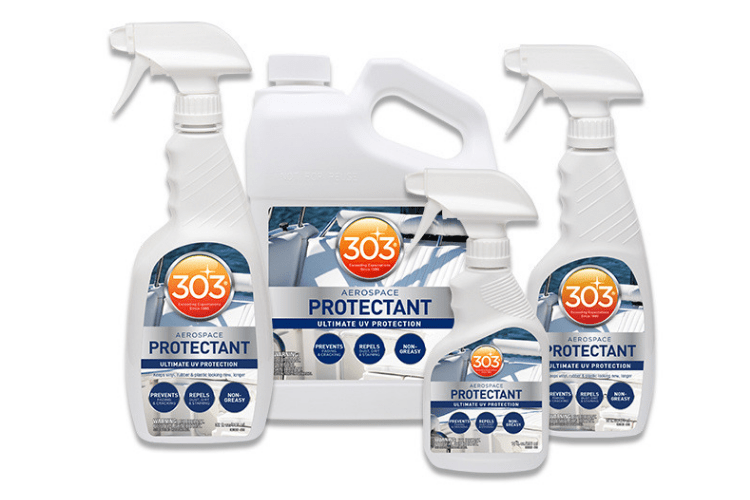 WHAT IS 303® CITRUS CLEANER & DEGREASER? 303® Citrus Cleaner & Degreaser safely cleanses and degreases surfaces by removing dirt, grease, oil, and much more. It also contains UVA/UVB blockers for maximum protection against the sun’s harmful rays. It is s alcohol, ammonia and solvent free. WHAT SURFACES CAN 303® CITRUS CLEANER & DEGREASER BE USED ON? 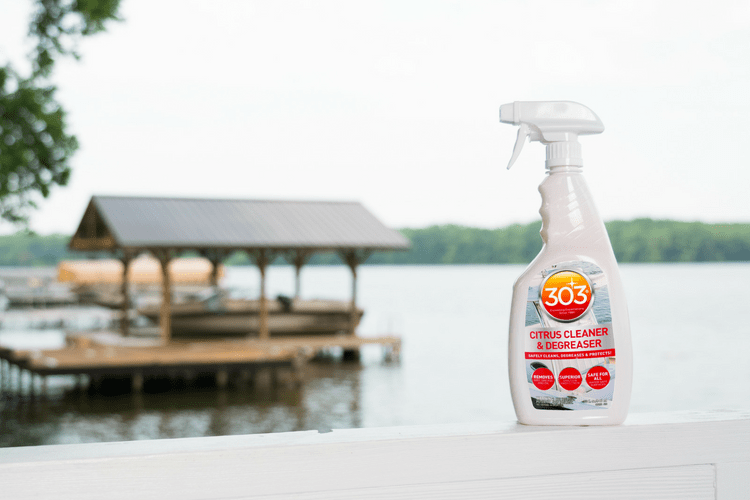 303® Citrus Cleaner & Degreaser is alcohol, ammonia and solvent free, and safe for use on all water-safe materials, including: fiberglass, plastic, chrome and painted surfaces. 303® Citrus Cleaner & Degreaser is not recommended for use on carpets, due to the protective layer that is left behind. For carpet care, please use 303® Multi-Surface Cleaner. HOW DO I USE/APPLY 303® CITRUS CLEANER & DEGREASER? 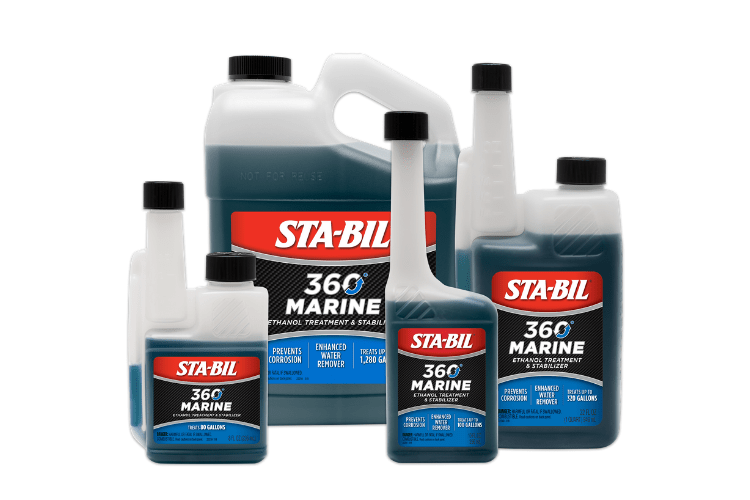 303® Marine Citrus Cleaner & Degreaser is rated 4.6 out of 5 by 57. 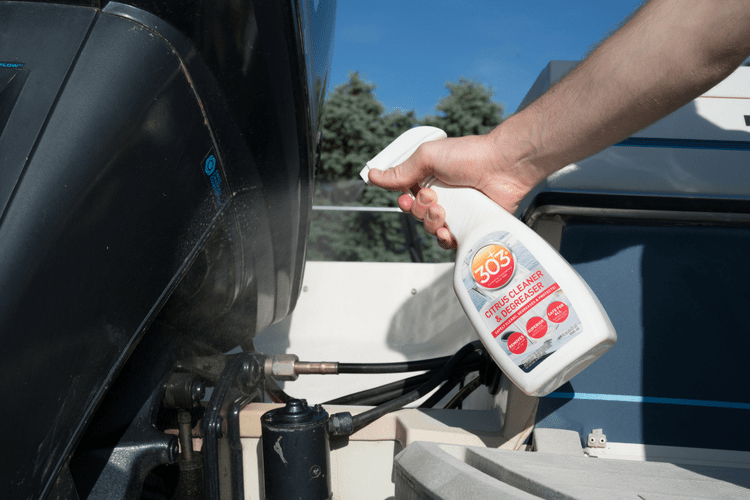 Rated 5 out of 5 by Thorshammer from 303 cleaner Finally had a chance to use this de-winterizing the boat. Anybody that has changed the oil in a boat, knows the mess you leave behind in the bilge area. After wiping up the oil with a rag the fiberglass is still stained. I tried 303 on it and let it sit for 5 mins. Extremely happy with the results. It's not slick anymore and this even cleaned the stained fiberglass better than the last "green product" I was using. After seeing the results in the engine bay, I can't imagine it will disappoint when I get around to cleaning the interior out this weekend. The smell is just an added bonus on top of a great product. Rated 4 out of 5 by Backlash from Works Great I used this for the first time on my boat trailer. It took the road grime off with no problems. I then used it on the wheels to get some bearing grease off and it did okay. I have yet to find anything take bearing grease off without a little effort. Next was the outboard and it cleaned the grime and water spots right up. It reminds me of Purple Power or Simple Green but a little thicker. It does smell nice. It stained my white terry cloth rags orange and I have not washed them yet to see if it will come out. I will be careful near any fabric or carpets until I know if the orange will wash out. Rated 5 out of 5 by Stymies from Great degreaser I decided to try this degreaser on my grill. Last year I made a beer can chicken and it tipped over and the grease from chicken started a little fire inside the grill. the inside of the grill was nasty. I was going to get a new grill and then decided to try 303® Citrus Cleaner & Degreaser and see if I could clean it up instead of buying a new grill. To my surprise it cleaned 95% of the grease, the other 5% is more or burn marks then grease. With a little pressure on the scrub brush it worked perfectly. Rated 5 out of 5 by cbblythe from Powerful cleaner with a much needed enhancement This is not your typical Citrus scented degreaser. Look, a citrus cleaner is something you are likely very familiar with if you are online reading reviews for them. This one has a nice new quality that really makes it stand out. It's one that has been lacking for so long, yet makes perfect sense, you'll imagine all the other cleaner manufactures are kicking themselves for not coming up with it. This cleaner is THICK. It will cling to even vertical surfaces better than other products, allowing the cleaner to do its thing rather than drip into a giant mess below after doing minimal work. It wipes off with no effort, and leave behind a nicely cleaned surface and the pleasant citrus scent you've come to expect from this type of product. All in all a very good cleaner for this type of application. Rated 5 out of 5 by wild bill from WOW ! I just received this product last week and took it with me to Arizona where I store our boat. This trip was to prepare it for the summer in which an oil change was needed, when removing the oil filter I managed to tip it enough to where about half the contents in it spilled out into the bilge, well.....I sprayed this cleaner on it and let it sit for a fews minutes, then wiped it up with a towel and that's all it needed, but just for the heck of it I applied it again and was even more satisfied with the results. This stuff is great, thanks ! Rated 5 out of 5 by 1972 Green Grabber from Works great, easy to use! I finally had a chance to use this, I have had it for a while but did not use it on anything, I pulled the distributor out of my engine to repair and tighten up some screws, once I got the distributor out I noticed how dirty it was, looking around the shop I saw the 303 Citrus cleaner sitting on the shelf, I thought I would give it a try, well it worked great! it got all the dirt and grease off of my billet Distributor and it looked like new once again, now i am gonna try it on some other parts and see what happens, love it so far! Rated 4 out of 5 by Gator from Protectant I expected more from this product. I went back and cleaned with bleach. Applied to the clean surface and works great as protectant. Product worked good on subsequent cleanings. Rated 5 out of 5 by mikec from Cleaner and degreaser worked well. Used this product to clean outside of boat and motor cover and both cleaned up very well. I also used this product to spray on wheels of my car. It also did a very good job of cleaning the wheels. I do recommend this product for the intended purposes cleaning and degreasing.